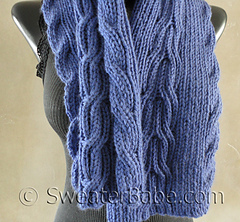 Approx 18 sts = 4” 10 cm and 22 rows = 4” 10 cm in 1x1 Ribbing on larger-size needles. 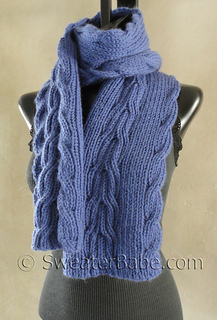 This reversible ribbed scarf was a special project I created as a gift for my DH on our 10th anniversary. In the center is a wide cable, representing how our lives are so intertwined. At each edge is a smaller cable that represents how each of our lives keeps evolving (twisting and turning!). The cables twist every 10 rows and the background is a basic 1x1 ribbing that echoes the ribbing of both cables, so that it all flows and fits together, like me and my DH have for the last decade! I knit it in his favorite color and made it a nice length so he can wrap it around his neck once or twice, or do the loop and pull-through thing. The yarn is Debbie Bliss’ Cashmerino Aran - a lovely yarn that is so soft to knit and wear. 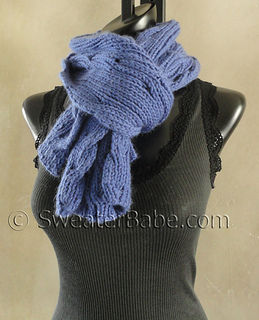 This is a great unisex scarf that looks wonderful on both sides. Easy cable twists that happen every 10 rows makes for a project that is not too challenging, but interesting enough to make while enjoying some great evening or weekend TV.